The first time you feel almost any art knit by Peruvian Connection, you'll appreciate it isn't made like most sweaters, jackets, or kimonos. For one thing, many of them are made with alpaca fleece, which is lighter and warmer than sheep's wool. The alpaca, which is closely related to the llama, is relatively common in Peru. And while they are sometimes used as food or beasts of burden, they are mostly raised for their soft, lightweight fleece. Nothing is really comparable, not even when the fibers are blended with Pima cotton, which has its own story of superiority. The quality if fine enough that it doesn't loose anything during the manufacturing. In fact, the Peruvian Connection won't take any chances. Most of the clothing is knitted by hand. The women who do it follow in the tradition of their ancestors. The work they create is nothing less than wearable art. Three amazing styles to head off cooler temperatures. One of the most immediately striking designs in this year's collection is the Kilim Pima Cotton & Alpaca Kimono (above). The kimono itself is a Kaffe Fassett-designed art knit that has been generously sized. It features drop shoulders, buttonless placket, and stripped border. Fassett, for those unfamiliar, is known the world over for his colorful work in fabric, knitting, needlepoint, patchwork, painting, and mosaics. Since 1937, his work has become so captivating that it's more likely to be seen in a gallery than in a clothing store. Few have his sense of intuition and history. In this case, his beautiful design made its way to Peru, where it was handmade using 60 percent Pima cotton and 40 percent alpaca. The inspiration for the concentric design is from a Turkish kilim, recast in hand-tweeded, space-dyed hues. 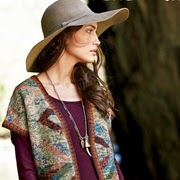 For a more bohemian look, another masterful Fassett creation is the Western Isle Alpaca & Pima Cotton Ruana. A ruana is a garment that is more typical of the Andes. Using this as his inspiration, Fassett was able to hand-frame the traditional style in dozens of tweeded shades, ranging from sky blue and sage to sand and plum. As a slightly warmer and more durable garment inspired by those worn by the Muisca people of Colombia, the ruana is made with 72 percent alpaca and 29 percent Pima cotton. There is only one size. A third highlight from the artisan knits featured in the upcoming collection is the Cotton Ukuku Vest. Although not designed by Fassett, some remarkable design elements are apparent. These are inspired by Andean weaving designs. The vest includes drop shoulders, buttonless placket, and ribbed trim. Some insight into the mother-daughter teams of Peruvian Connection. 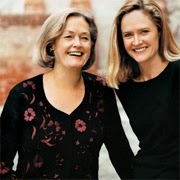 The mother-daughter team of Biddy and Annie Hurlbut can trace its roots to the 1970s when Annie Hurlbut was spending her sophomore summer at an archeological dig in Peru as a Yale student. It was there that she encountered the alpaca. She never forgot the experience, eventually deciding to return to Peru and write her thesis about women who sell in primitive markets. She was so inspired by the craftsmanship, she began to add designs to their otherwise warm and practical clothing. The results were breathtaking. When she returned to her family's farm in Kansas, she produced a catalog with her mother and then took some samples to New York City. Bendel's was among the first to purchase them, but not the last. Art Knits By The Peruvian Connection Weaves 9.5 On The Liquid Hip Richter Scale. The Peruvian Connection apparel is always worthy of being admired. But then then you add the unique, one-of-a-kind design talents of the masterful Fassett, the colllection's art knits truly become works of art. You can learn more about Fasset in Dreaming in Color: An Autobiography. The best place to appreciate the entire apparel line of the Peruvian Connection is direct. If you can't find what you are looking for at Peruvian Connection UK, the company has another site stateside. Occasionally, you can find random items on sale, such as this Burgundy Florecita Pillow, on Amazon.